I recently added a Tunisian Crochet 101 class to my repertoire at my local yarn store and thought I would share my lessons with you here. So get out your hook and let’s learn Tunisian! Tunisian Crochet is notorious for curling, especially on the beginning edge. My biggest tip to combat this is to make sure you are using a large enough hook size for your yarn weight. There is a bit of trial and error and personal preference that goes into this. For instance, I find a J or K hook works well for me with worsted weight yarn. If your piece is still curling a bit, no worries … I have a couple solutions to share with you later: edging and blocking. 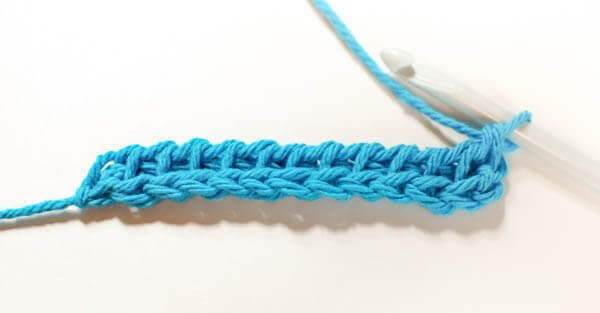 As in traditional crochet, your Tunisian project will begin with a starting chain. 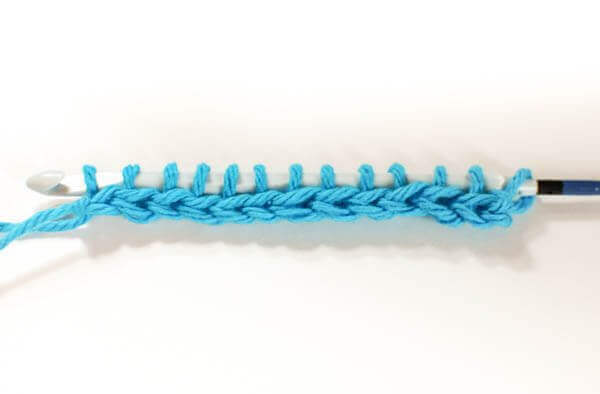 But unlike traditional crochet, the number of beginning chains worked should equal to the number of stitches you want in your first row (there are no extra turning chains worked). Tip: If your beginning chain is too tight, you may want to start with a larger hook size. Every row of Tunisian Crochet consists of two steps: a forward pass and a reverse pass. You will work with the right side facing you throughout. When working your first row, you will be pulling up a loop in each chain across. 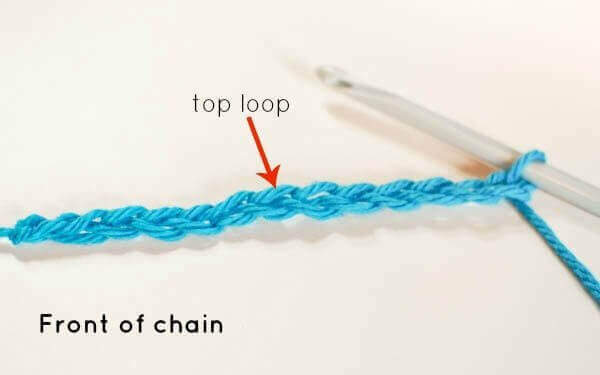 You can work in a couple different parts of your chain (e.g., top loop, back ridge, top loop and ridge). To give your foundation edge the same look as your finishing edge, you would work in the back ridge (or bump) of chain. 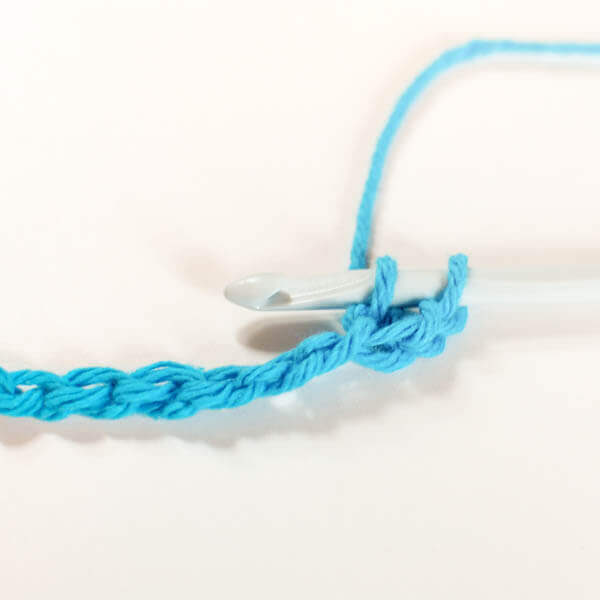 Insert hook into second chain from hook, yarn over and pull up a loop. Continue in each chain across. The Basic Return Pass is what you will use most of the time. 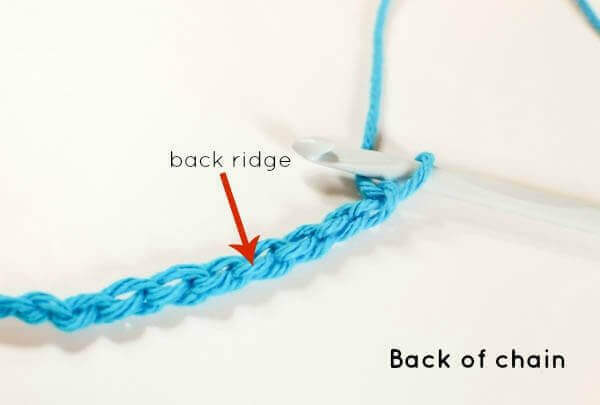 To work the Basic Return Pass, yarn over and pull through one loop, then yarn over and pull through 2 loops for the rest of the row until you have one loop left on your hook. You have now completed your foundation row! Hi, i tried this and when i come to the end of the first reverse line i end up having 2 loops on my hook, what am i doing wrong? When you have 2 loops left on your hook, just yarn over and pull through both and you will be left with 1. Thanks so much for the clear directions and pixels. I have crocheted for 30+ years but have never done Tunisian. I look forward to this beautiful handwork. Thanks for your time and effort! This reminds me of the afghan stitch. Do you think it is similar? Love the patterns. Is there a hook that I could use for this stitch that is more ergonomic? I would love to learn this, but have a hard time holding a standard hook due to arthritis and surgeries. Pinned ’cause I’ve always wanted to learn this technique! Thanks for the tutorial. I just wanted to thank you for this tutorial. I started this graph pattern and I have already 27 rows and I have been picking up on the last stitch I pick up 2 stitches instead of one. I don’t want to have to take it all out again is there away to fix it without taking it all out. Please help in a jam. Thank you for your time and help. I have seen some Tunisian stitch patterns, and I find them to be gorgeous!!! I have been aching to learn how to do Tunisian Crochet. I have been crocheting for years and years. When I was about 8 years old I learned how to knit, I did that until I was about 13 and then found out how to crochet. I was hooked, no pun intended! I have seen some video tutorials, but I found the way you do it with pictures is so much easier to follow (no rush to keep up and no reversing to make sure I have it right). 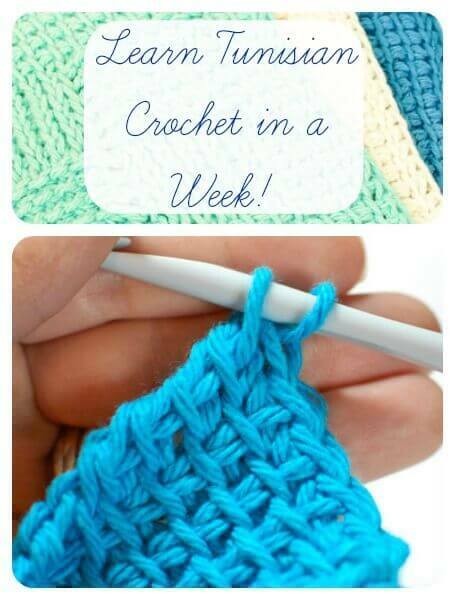 I find Tunisian Crocheting so easy! An in a way, I feel like I am knitting (with one needle…LOL!). I have learned how to do the simple stitch so far and I love the look of it. I am really excited to learn so much more. Thank you so much! Keep up the great work!! 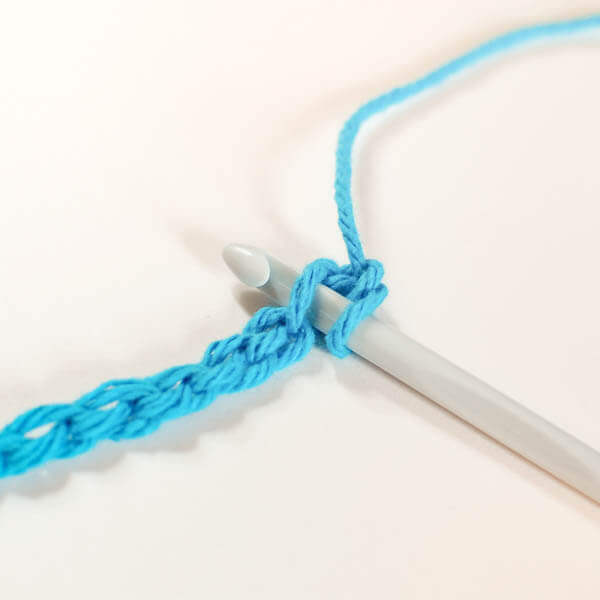 What type of crochet hook do you use for the Tunisian crochet? Hi Lynn 🙂 There are special hooks for Tunisian that are longer or have an extension that you can put on if you need more room for stitches. I like the Denise Interchangeables Hooks. 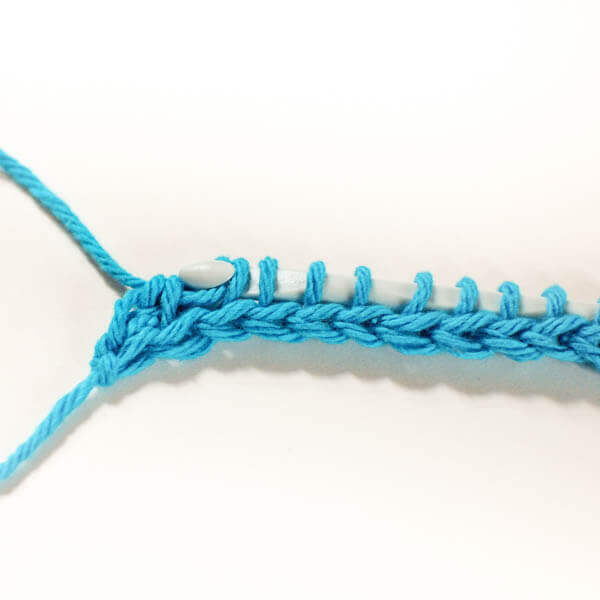 TC has so many different stitch patterns – some look like knit and others like crochet and then both k and c combined! There is an online Tunisian Crochet group, for those interested in learning more. I think wherever learning is available is good to enjoy! Picture: you’re knitting a sweater and then decide to do a few rows of a TC pattern … and then a different look by crocheting. For anyone interested in another technique, look up Knooking. 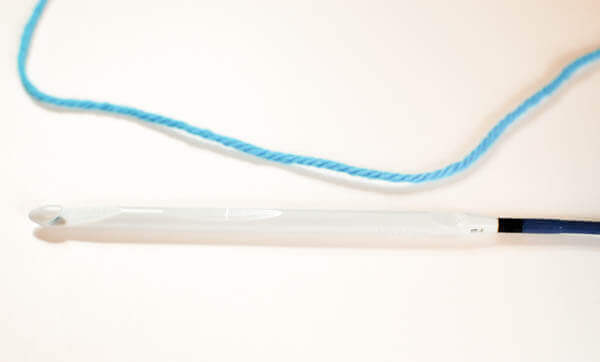 That’s knitting with a crochet hook. Thanks, Kara, for sharing so much of yourself. Hi Kara, I am trying this technique for the first time. I started with 10 stitches on a regular J hook just for practice. When i did the return pass, there was not only the tail of yarn, but the knot from the slip stitch sort of sticking out, is this correct? From the pictures it looks like it is. I had 10 loops on the hook before I went back across following your instructions. Want to make sure I got it right before trying something larger. Thanks so much, LOVE your site!! I sent you a message on Etsy yesterday about your pattern for baby clutch balls…Love, buying soon. I just want to say thanks for sharing your joy of crochet and your knowledge. I’ve always wanted to learned Tunisian and if anyone could teach me you can! Thank you! Finally a site i can understand. I love your projects!! love the way u make it so easy to follow. But ware do I get the needle to make this and how to change colors. Hi Edna 🙂 You can find the Tunisian hooks at any yarn store or even online. As for changing colors, I hope to have a tutorial up for that soon. this is great, thank you so much. i absolute despise video tutorials, so seeing it all written out with pictures works great for me. looking forward to trying this and some of your other patterns as well! Thank you for your tutorial. I am doing it right now. 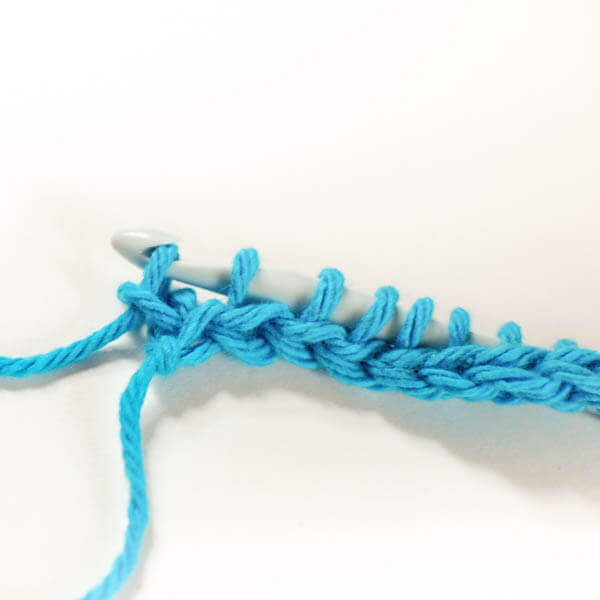 I love to learn new stitches. What kind of things could you make with it? I am making a small hot pad now. Hi and thanks for sharing this tutorial! I have been wanting to learn this for a while. I will try and look at this and learn it. Ooooh … Can’t wait to see it Ana! Thanks! Very excited to learn from you! Trying it now! You rock! Hope you find it helpful! !